We wrote last month about preparing your home for the winter months, but we felt we needed to expand on the importance of taking care of cracks in your home’s foundation. When water turns to ice it expands around nine percent. This may not seem like a big number, but when you are talking about cracks sometimes only being a hairline, it can make a big difference. The pressure this expansion can put on your concrete is very strong and cause the crack to spread and cause even more damage. The freezing and melting processes can both impact your concrete. The damage can occur with the first freeze-thaw cycle and it will just grow exponentially from that point, growing worse with every cycle. The problems can affect both the concrete slab and the foundation walls. If the cracks allow water in, it can cause standing water to enter your basement or crawl space or water to enter your foundation blocks. It can also cause concrete shrinkage and other problems. There isn’t anything you can do to stop winter from coming, as much as some of us would like to. The damage the weather causes isn’t limited to the concrete foundation, it can affect any concrete surface around your property. The top layers of concrete can flake off in what is called mortar flaking. As mentioned above, cracks can appear or get bigger. Lastly, the water can cause popout. Popout is caused by water swelling under the surface, which can cause flaking and crumbling on the top of the concrete. Some damage is visible, but other times it can occur below the surface. Protecting your concrete is important at any time of the year, but it is especially vital during the winter months. There are some things you can do to prevent ice damage to your concrete. In the past, people just used salt on their surfaces, but it was found that the salt can do as much damage as the ice. We recommend you use an ice melter that contains potassium chloride. 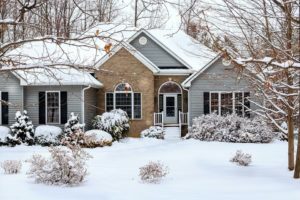 Make sure that the area around your home is ready for winter. Make sure that downspouts and gutters are clear and draining well away from the foundation. Clear snow and ice from around the foundation. Melting snow can trickle down the sides of the foundation wall and cause damage. Matthews Wall Anchor & Waterproofing has waterproofing services available. We’ll come out and take a look at your property. If you only need waterproofing repairs we can do that; if your home already has cracks or other foundation damage, we can help with that, too. It’s best to get your home ready for a visit from Old Man Winter before he gets here. Taking care of problems now, while it’s still nice out is better than dealing with it in the middle of winter. Contact us now to learn more about getting your foundation ready for winter!